Managing an office takes strength of character, a metric ton of patience, a ridiculous amount of tolerance, and teamwork. How do you feel about your own success? Are you struggling to get by, or are you breezing through? We all know the skills office managers are known to possess to keep the dental practice running smoothly and successfully. But, after having multiple conversations with dental office managers over the years, it’s clear that there is more to managing an office than the usual skills and traits. It all starts with attitude. How do you handle that overwhelming feeling of managing an office of people, all the patients, and all the paperwork? Are you always stressed, always at the end of your rope, always snapping at people? The attitude needed to be an effective office manager does not always mean you have to be a workaholic or so dedicated you can’t take a day off; actually, it’s the exact opposite. Already, I can hear the office managers I’ve discussed this with vehemently disagreeing. They feel that if they dare to step away for even a second, the consequences will be dire, and it will be their fault. The reason for this seems to be a consensus: they’re in this alone. The truth is, you’re not. And giving a hundred and ten percent to the job does not mean you sacrifice yourself for it. 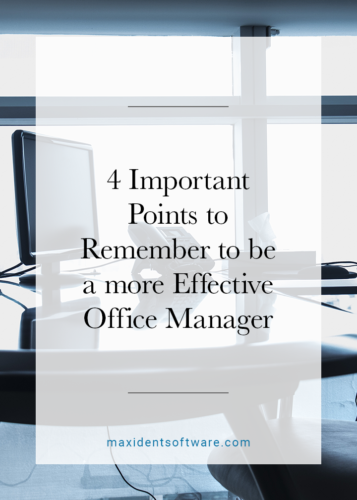 Here are just four important points to remember to be a more effective office manager. Plain and simple: you are human, first, and an office manager second. This means that sacrificing your health, your sleep, and your sanity is unfair to the human part of you that needs to keep all three of these things intact. If you aren’t sleeping properly, or exercising, or relaxing when you need to, you can’t be an effective office manager. Everything to follow directly connects to this very important point. If you want to be more effective, more productive, and give a hundred and ten percent, you have to focus on you first. I see it with office managers in every industry—they are asked to be in two places at once, or do three jobs at a time. Realistically, it’s impossible. I actually had an argument with my own boss when she expected me to be at the back of the store and the front at the same time. “How do I do that?” I asked her. She had no answer. And of course, she didn’t. Because being in two places at once is impossible, unless you clone yourself (no one should be asking you to do that, either). After trying to take on tasks from the boss and others around me, I now work by one simple rule: Whatever the boss asks of me, I comply. It’s part of the job and I have no issue with it. However, if anyone other than the boss assigns me tasks, it is my obligation to ask questions and make sure I can fit whatever that task is into my schedule. You only have two hands to juggle and no more. So, anyone else who adds on is only going to make your workload heavier and increase your stress level. Don’t bite off more than you can chew, or in other words, manage your workload effectively, and don’t take on extra jobs if you know you can’t handle them.This comes back to our main point: You are human first. 4. You deserve time off, too! You are a devoted and hard worker, loyal to the dental practice and the dental owner. Let’s face it, you’re keeping everything balanced, not just the financials but the entire practice. So how can you leave? If you leave, won’t it all just fall apart without you? This kind of attitude is unhealthy as it makes you feel guilty when you want to take time off, even going so far as to not take time off. Too many office managers I’ve talked to insist they just can’t do it. Or if they do decide to take a vacation, they have to keep their phones on and their email available in case of an emergency. You deserve to take time off! A good friend of mine used to take a week off out of the two weeks she so clearly earned, and what was worse, she felt guilty for it. Every day that she was gone, she worried that everything was falling apart and it was her fault. Now, she knows better. She knows that by taking her earned time off, she is helping rather than hurting the company. She understands that when she comes back, she is refreshed, recharged, de-stressed, and able to give a hundred and ten percent. If you are feeling guilty, that is just more stress you don’t need. Vacation isn’t just for the dentists. The office managers, receptionists, treatment coordinators, and hygienists need that time off to relax and unwind, too. Stress is greatly reduced when you take time for yourself without worrying that the office won’t be okay without you, no matter what role you play. Dental office managers who feel alone and overwhelmed deserve a place to air out their grievances and share their successes. If you would like to join that kind of growing community, just click the button below and become a member of the Dental Office Managers Association of Canada. There is no fee to join. All we ask is that you get involved and share your stories with other office managers who may feel just as alone as you.